For this introduction, I will assume you have Visual Studio 2015 . The purpose of this tutorial isn’t necessarily to understand all of the inner workings of ASP.NET, C#, Visual Basic, etc. Rather, the goal is to get a feel for how all of this works together and to start seeing how the code looks. ASP.NET is a free server-side web framework developed by Microsoft. It is good for dynamic websites, applications, and services. Many languages are compatible with ASP.NET including Visual Basic, C#, J#, and Jscript. It works on top of the HTTP protocol and uses HTTP commands and polices for browser-to-server communication. It is part of the larger .NET Framwork (also by Microsoft). You can learn more at the official website, www.asp.net. MVC stands for Model-View-Controller. It is a method for making applications that are well architected, testable, and easy to maintain. Controllers are classes that handle the incoming browser requests, interpret them, then send a response back to the browser. Our first app, below, will use MVC. 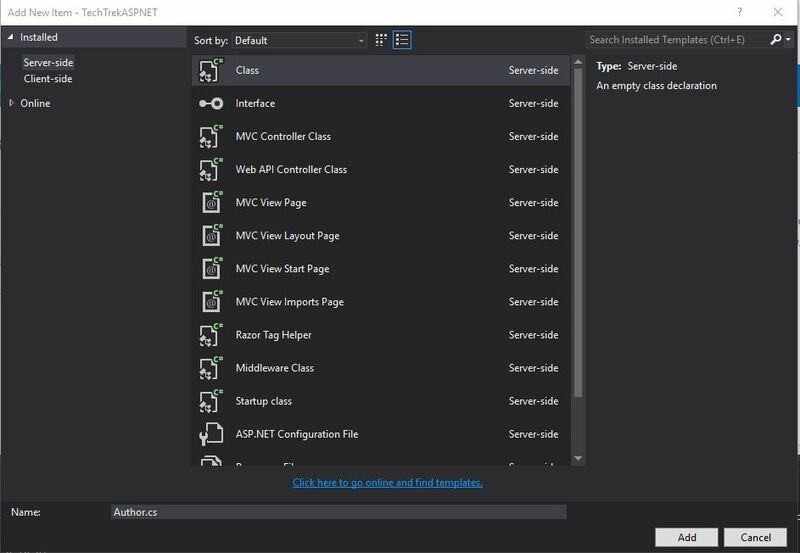 Download and install ASP.NET 5 here. This will install the latest runtime and tooling. Once the executable downloads, click I agree and then Install. The process may take several minutes. This will make the default .NET Execution Environment (DNX) the active path. Finally, we also need to download and install the Visual C++ Redistributable for Visual Studio 2015. Once the executable downloads, click the box to agree and then Install. Open Visual Studio 2015. Next choose File – New – Project. 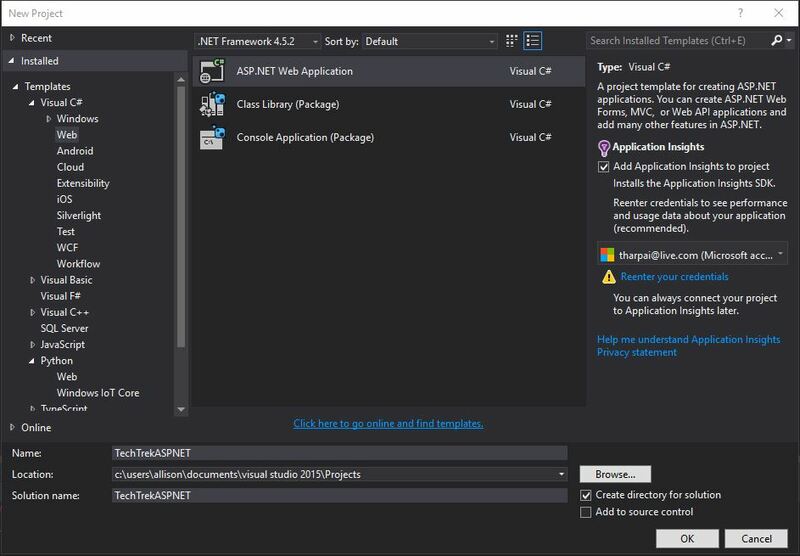 In the New Project window, Choose Installed – Templates – Visual C# – Web. Then, keep the default (ASP.NET Web Application). Near the bottom of the window, type a name for your project. Mine will be TechTrekASPNET. Click OK when you are done. 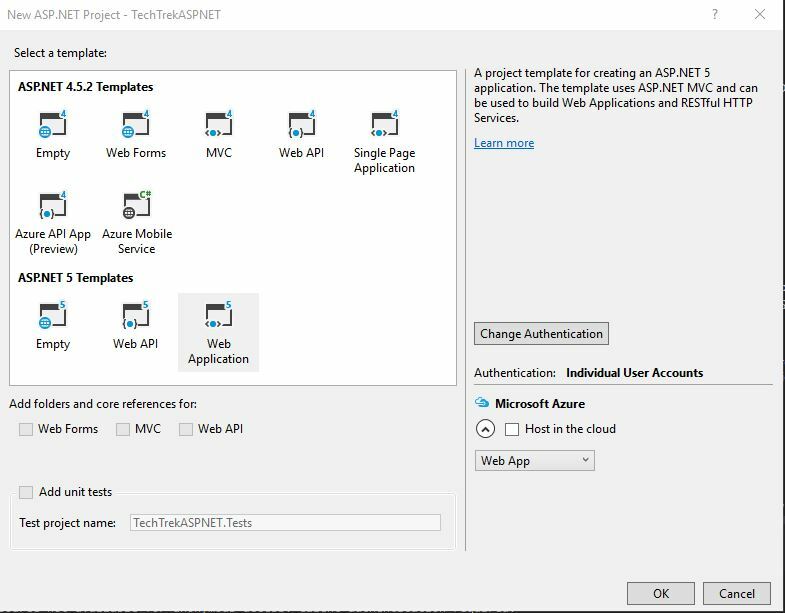 The New ASP.NET Project dialog box will appear. Select Web Application at the bottom under ASP.NET 5 Templates. My Microsoft account does not have a cloud subscription attached, so I unchecked the Host in the cloud option on the right. When you are done, click OK. It will take Visual Studio a few moments to create your app. You will know it is done when the output window stops (the last line should say something like “Installed: 235 package(s)“. Once it is complete, test it out by going to Debug – Start Debugging (or, press F5). While this page is open, go ahead and adjust the window size of your browser and notice how dynamic the page is — this is the power of ASP.NET. When you are done looking at your awesome new web app, close the window and click Stop Debugging in Visual Studio (it is a red square in the top and near the middle). An entity class is a class you create to define the schema of the data for your app. 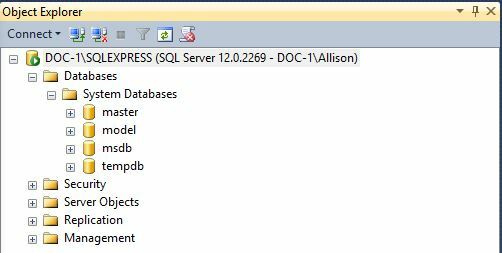 Think of it as table definitions of a database – each property will specify a column in the table of the database. We will create two: Book and Author. In the Solution Explorer, right click the Models folder and select Add – New Item. In the Add New Item window, make sure Class is selected and type ‘Author.cs’ in the Name textbox. When you are finished, click Add. We can put model classes anywhere in our project, but it is common convention to keep them in the Models folder. Scaffolding automatically generates a starting point for your CRUD operations. CRUD stands for Create, Read, Update, and Delete. The neat thing about it is that we can create controllers to contain the CRUD information without writing any code. In the Add Scaffold window, select MVC 6 Controller with views, using Entity Framework, then click Add. In the Add Controller window, click the down arrow for the Model Class and choose Book. For the Data context class, choose ApplicationDbContext. If it isn’t checked, make sure Generate Views is selected. Click Add. This creates a set of views which will provide the User Interface and the code to CRUD data from the database. Do the same for Author. 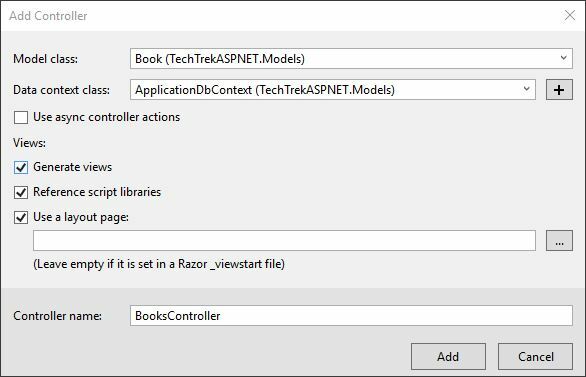 When these are complete, you should see AuthorsController.cs and BooksController.cs under the Controllers folder in the Solution Explorer. We also just created Authors and Books folders within the Views folder. If you try to load your web application now (by debugging), you will receive a 500 Internal Server Error because it will be unable to locate your local Local Database Runtime installation. We want to do data migrations with EF (Entity Framework). EF is an objection-relation mapping (ORM) framework. It will let us work with relational data as objects, which will allow us to not need to write as much data-access code. By doing our data migrations this way, we will be able to update all of our models throughout the application with a few simple steps — this way we can build and maintain the app more efficiently. If we didn’t do it this way, we would have to recreate our entire database every time we wanted to change the model or schema. Open the command prompt in your project directory. 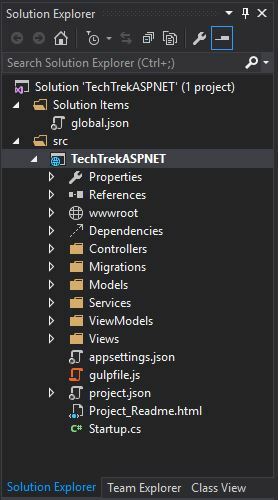 For me, this is C:\Users\Allison\Documents\visual studio 2015\Projects\TechTrekASPNET\src\TechTrekASPNET. If you are unsure where your directory is, right click your solution name within the Solution Explorer and click Open Folder in File Explorer. To open the command prompt in this location, hold shift while right clicking in the blank area of the file explorer. Choose Open command window here. The trick here is that there needs to be two backslashes before SQLEXPRESS. This will add links to the top that say Books and Authors. That’s it! This walk-though was pretty generalized but I think I have enough understanding now to create my own web app. I have several ideas that I think could work well as web apps, so as I find time I think I will start working on those.